Welcome to Garden Bloggers' Bloom Day at May Dreams Gardens! The August garden seems to have a certain maturity to it here in my garden. Long gone are the sprouts and tiny flower buds of spring and in their place are mature plants, some just starting to flower and others continuing a show that started much earlier in the summer. These blooms are what I call August Lilies, an old-time variety of Hosta that actually blooms in August. Unlike the smaller hosta blooms I see in June and July, these blooms are bigger and have a sweet scent that is lovely and heavy like a hot summer day. They are passalong plants from my sister-in-law, but they could just have easily come from my grandmother's garden, as I remember she had hostas that flowered in late summer in her garden, too. Late summer? I don't like the sound of that! The surprise liles (Lycoris sp.) started blooming a week or so ago. Some gardeners call these Resurrection Lilies because the foliage comes up in the spring and dies back, and then out of nowhere it seems, these stems come up with these big pink blooms. Others call them Naked Ladies because they lack leaves when they bloom. Last summer, my Resurrection/Surprise Lilies were planted over by the side of the house near an air conditioning unit so I dug them up later in the fall and moved them. I think they look a lot better mixed in with other flowers. And since I moved them, it seems like I have a lot more of them. Last fall, I also planted Hydrangrea paniculata 'Tardiva'. It is definitely going to brighten up the area where it's planted. Those blooms seem to get whiter every day. Another white bloom is out in the vegetable garden. This is cilantro gone to seed. I need to work on my timing so that the cilantro is ready to harvest for making salsa at the same time as the tomatoes and peppers are ready to be picked. On the edge of the garden, the 'Concord' grapes are starting to turn to purple. These add some color, so I'm counting them as "blooms". My garden, my rules! It won't be long before these are ready to be picked and I can make some grape jam again. The other day, I saw that some of the Chrysanthemums are starting to bloom. It seems too soon! Then I noticed one of the 'Autumn Joy' Sedum is starting to show some color on its bloom, too. I can see 'autumn' in these blooms, just like I hear 'autumn' arriving in the garden every time I hear the cicadas in the trees. But let's not think too far ahead, let's just enjoy August for awhile longer. What's blooming in your garden today? Show us with your own post for Garden Bloggers' Bloom Day. It's easy to participate. 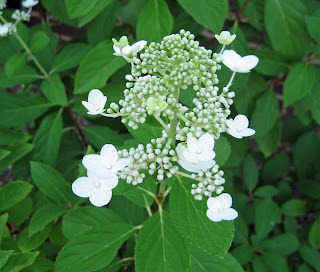 Just post on your own blog about what is blooming in your garden mid-August. You can include pictures and words, just pictures or just words. Botanical names are strictly optional. It's your blog, your rules! Once you've posted about your blooms, come back here to this post and leave a comment, so we can find you and see what's blooming in your garden. Yes, count those grapes! I love the color---so delicate and blushing. 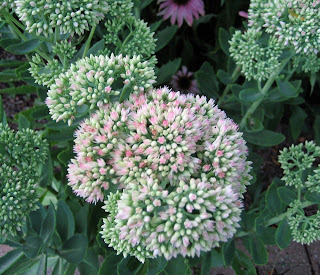 And I LOVE the idea of Autumn Joy sedum blooming, Carol, and you know why. My rad Bloom Day post is up too. OK, we call them belladonnas in our house. I love them on farmhouses in the dry grass, or remnant farmhouses. My favourite is the dark pink, we have a white, but haven't the dark pink atm. I have mine done. Thanks for hosting. I love surprise lilies, we call them "magic lilies." My Autumn Joy is getting ready to bloom too. Here's some of what's blooming in my garden this month. What lovely subtle colours around your garden. Don't eat those beautiful grapes just yet ;-):too pretty. In spite of non-stop rain and cold winds bordering on storms, some plants have performed remarkably well. Thank you yet again for encouraging me to take a closer look around my soggy windswept garden. I still found quite a bit to photograph and came away uplifted. I didn't know cilantro flowers are so pretty, and complex. your garden seems to be a beautiful place in August as well! 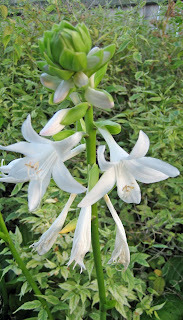 - I like the old-fashioned Hosta with white flowers a lot! My post is up too. I am especially excited about seeing the Autumn Joy show us its beauty. Thank you for hosting this bloom day and much appreciate all the work involved. Plenty of rain on most continents this summer it seems. Although this morning the sun is out!!! An unusual event over here in the UK. A chance to retake a few of my photo's which looked a bit somber. You are a few weeks ahead over there, as my Homburg grapes are not showing colour yet. I wonder how your ground cover rose 'Snow Carpet' is doing. Ours is so tall, you can't call it a groundcover. Did you notice the scent? It is an offspring of Rosa 'Margaret Merrill, which also smells delicious. My blooms are on my bloomday page here. I'm so enjoying all your tomato posting! I love your hydrangrea, I like lace caps. Lots of whites and pale pastels in your garden today. I had cilantro growing out of a crack in the pavement one year, right at the back door step. Some coriander seeds spilled while I was cooking, and one must have rolled out the door. There was a lovely perfume coming off their flowers that wafted into the house every time the door was open. Magic! Mmmm...I can just imagine the fragrance of that hosta; what a beauty. 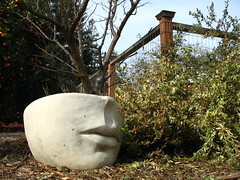 My post is up at www.gardeninggonewild.com this month. Happy Bloom Day to all! Hi Carol, like PG your hosta looks like Royal Standard, a variety old enough to have been growing in your grandmother's garden. 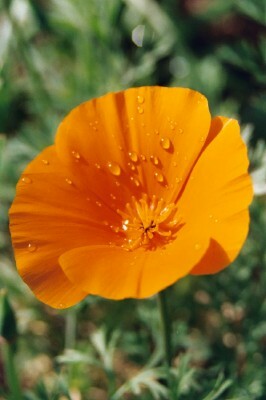 It blooms in August with fragrant blooms, can take full blazing sun and is tough as nails. Your mums are open? That is early! What does it mean? A friend gave me a Beladona (naked lady) bulb. I can wait to see it bloom in my garden. First of all thank you for gain hosting Bloom Day! Second, I love your Surprise Lilies and the HYdrangea bloom is lovely! Have a good day! Hi Carol! Wish you a very Happy GBBD. You have a lot blooming in your garden, I've some up my sleeve...err garden too. My blog list is up. Tardiva is one of my favorite paniculatas, primarily because it is the last hydrangea to bloom for us. I learned to remember the name because it is a late/tardy diva. Cilantro goes to seed very early in our heat, so I have to sow several times to have an adequate supply. It now volunteers too, but not always where I want it. Hi Carol - I'm glad you included the grapes - I've got a pic of particularly pretty tomatoes (which might have been better included in the tomato meme...)! I'm thinking about autumn too but trying to remain in the August moment. Thanks as always for hosting bloom day! Here is my post this month. I love those "August Lilies"; it just wouldn't feel like August without them. Autumn seem to be knocking at your door, but none of my Sedums have started blooming yet, although Matrona might later today, but it's always an early one for me. The grapes are beautiful, I'd don't blame you for including them. I'm trying tiny url, so (hopefully) here's the link to my Bloom Day post. www.tinyurl.com/6b5j49. I've never heard of surprise lilies - shows how much I know! They'd look great coming up through myrtle or the leaves of lily of the valley. Here's a link to my post. It focuses on long-blooming perennials. I look forward to checking out everyone's posts to see what else is blooming. Beautiful August blooms Carol! That's a beautiful hydrangea! 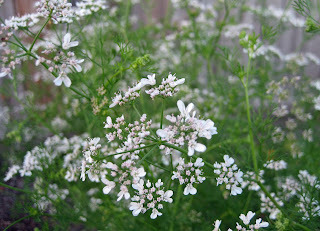 Don't you just love those tiny cilantro blooms. They're gorgeous. Hosta 'Royal Standard' is one of my very favorites! It was the first hosta in my first perennial garden, passed on to me almost 30 years ago by an elderly gardening neighbor who could have been my grandma. The ones in my garden today are divisions from divisions of that original hosta. Thank you for all you do for the garden blogging community, including sponsoring GBBD each month. My post is up. My cilantro has already finished with seeds, but they were too mildewy to keep. I've seeded another row of them, and they are just starting to shoot up, but I may have to eat last years coriander. My 'Autumn Joy' Sedum is still totally in bud, so didn't join in this years bloom day. You can see my bloom day post here. Wow...it's only 7:50 in the morning here, so I thought I'd be one of the first commenters! Ah well, I may not be the early bird, but my Bloom Day post is here. LOVE your grapes, and your surprise lilies look very happy. Mine aren't up yet, so maybe my autumn is farther away...I hope! :) Happy Bloom Day! I definitely need to add some grapes to our garden, those look pretty good! I like the hydrangea. 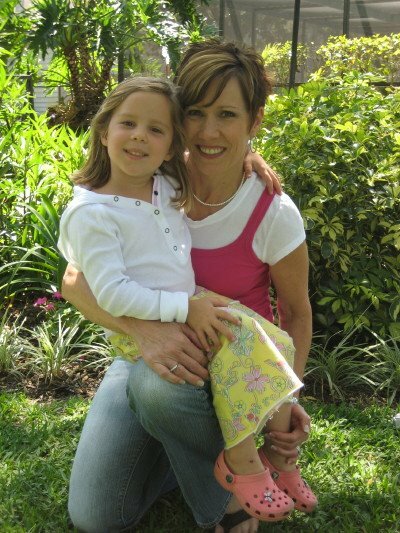 Here's my GBBD Post:GBBD-August 2008. The grapes are fantastic! Thank you for posting about the hosta -- I have them too, from my mother. Maybe they are Royal Standard as some have suggested. 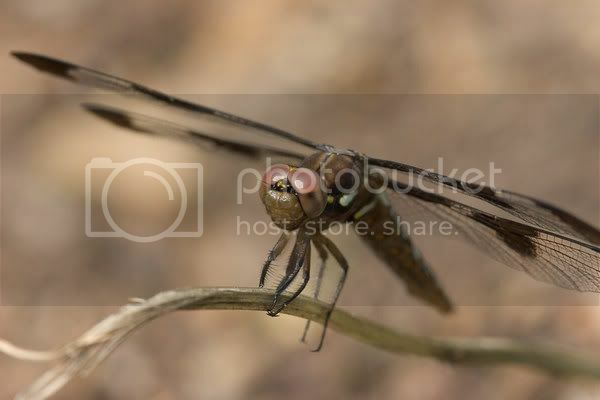 Thank you for sharing your garden and hosting GBBD! Mmm...grape jam. 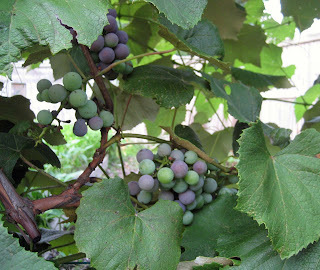 :) I've always wanted to try growing grapes; I love that gentle gradation of color as they ripen. Your garden looks marvelous! I'd count those grapes too! I'd have some pictures of concords in my post, but they were already done, picked and made into juice by the time I posted. And we narrowly beat the birds to them, too. 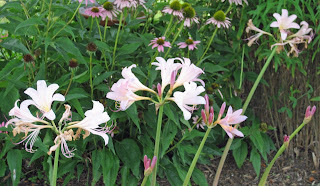 My post is up -- seems to be a good year for Naked ladies (that's what I call 'em cause that's what my mommy called 'em). The grapes might not be flowers, but they are certainly beautiful. That hosta really does look like it could be a lily. Thanks for hosting! I actually got my post up on the right day for a change. I have the same hostas that you do, and I always look forward to their blooms. Last year they bloomed beautifully; this year, there's nothing yet! But I do have some nice blooms and purple grape (woodbine) on my Bloom Day post, and some fishy (and froggy) photos in previous posts. I've never noticed that you had grapes before! How cool! Your grapes look luscious and lovely! My sedum isn't quite ready to show color yet. does your sedum escape into the wild? I've noticed some growing under some tall trees that separate my yard from the park next door. It's just sprung up this year, and it's nowhere near the sedum in my yard. My Bloom Day Post is Up, too! By the way, Carol, my grandmother has some of those lycoris, which she calls Resurrection lilies, and she has told me for the last couple of years that hers should be divided, too, and that I can have some. We keep missing our opportunity, though, it seems... we couldn't find spent stems when we looked, and I don't want to dig them too early! When did you move yours? I'm assuming that after the flower stalk dies back is the best time... is that right? We call those "surprise lilies" - "Naked Ladies" - they just jump up after the foliage has long died back. I love seeing them around town in yards that clearly had great gardens at one time but are now just mere lawns. I too love "August lilies" here in the Mid-Atlantic they call those hostas "Plantation liies" or just comon hostas. I LOVE that honeysuckle smell wafting off them on a hot summer day. My August Bloom Day post is up. Your pictures are beautiful.You don't realize how many flowers you have till you start looking and taking pictures. Glad to be a part of this. It was fun. I will have to get some of that hosta. Mine are basically done, and I don't have any that are spectacularly fragrant. What I do have is listed here. Wow this is amazing. Carol - your garden is wonderful as always (I now wish I'd posted my tomato flower pictures - don't you think veg flowers are gorgeous?) love those grapes. Here's what's flowering in my garden - and thanks for hosting GBBD! Hi Carol. This is my first time to join you for GBBD. I love all your pass-along plants! And, I can't believe we are talking "late summer" either! I have zone envy from looking all the southern gardeners, but here's what's blooming in zone 3 (Calgary, Alberta, Canada). At any rate, what's blooming in my world. You probably wouldn't miss my few photos and list of botanic names - but I promised to try so they're up on my blog, Carol, just in case having one extra participant could break the record for you! This is my first time posting for Bloom Day - sure hope I'm doing it right! 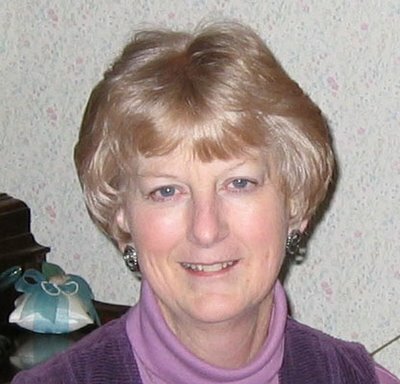 Carol - What lovely blooms on your Hosta, and your Hydrangea is doing very well - I like the white Hydrangea's. Thank you for hosting another Garden Blogger Bloom Day, and my post is up. My grandmother always called them Surprise Lilies. I don't have any, but wish I had some of hers. My list is up. Thanks for hosting! My post is up, and for me, August just means that soon, it will be cooler---in about 6 weeks. ahhh Houston. My fuschia are blooming for GBBD. My GBBD post is up, and I was surprised to note how many blooms I had considering it is the middle of our hottest month. I really love your grapes! I have been wanting to plant some, but I fear I may not have enough space. How much space do your grapes take up in your garden? i posted earlier, about your lovely bella donnas. And i need some. And I am up and posted over at www.idahogardener.com. I finally found something blooming just before dusk. Thanks again for hosting GBBD. A wild symphony of blooms on a mountaintop is ready for Bloom Day. I have also been snapping shots of the most hideous tomatoes you can imagine. I'm number 67 to comment, Carol. How wonderful that so many garden bloggers have posted for GBBD. Hi Carol, Love the white hydrangea! I put some belladonna (or surprise) lilies in the ground this year for the first time and ... nothing happened. Sigh. Yours are very pretty and what I was hoping to see at the end of summer. Well, one can't have everything. Love, Love the grapes... "your garden, your rules"... I like that. Oh and how I wish I could grow some of that autumn joy sedum... very nice showing this month! Your blooms like great, as always! This is the time of year my garden starts to wane a bit. I try every year to plant more last summer and fall plants, but I've still a long way to go. Here is my post for this month. I like all your white flowers. I love white flowers anyway but they always seem especially refreshing in the summer. Plus I like how they glow in the moonlight. 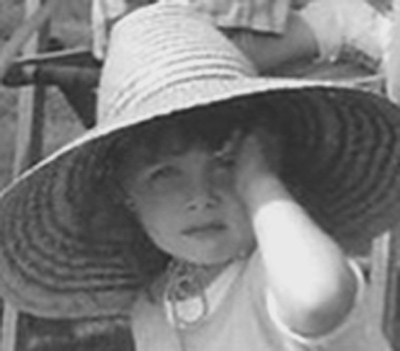 Is your Tardiva in sun or shade? I have one that I love in mostly shade but I think it would bloom better if it had more sun. I must have a look and see if my 'August Lily' hosta is blooming. I love that sweet scent! Grapes are as pretty as any blooms, and should definitely be counted! I noticed yesterday my sedum is beginning to show signs of blooming too. I need at least another month of summer!! I have a preview post up, which is all I had time for today. It's not midnight here in California so I'm not TOO late! But my post is up. I wish we could grow cilantro with our tomatoes and peppers too but it's been gone for weeks because of the heat...it just doesn't seem right. Your grapes look yummy...I imagine it will be jam making time soon! What a great group of gardens and bloggers! I've visted a few of you, enough to know that gardens can look great in August. I will work my way around to everyone over the next several days. Thanks for participating! For those who haven't posted yet, there's still still time; no one minds if you are late, we still would love to see your garden blooms! Carol, I am so jealous, you have grapes!I'm running a little behind on my Bloom Day post, but it's up now. It's wonderfl to see all of the blooms in peoples' gardens. Mine are now up. The WWWs have a GBBD post up this month. Thanks for your pictures - the grapes look lovely, and they're colour. Ours are ripening now too. Hi, Carol--I've posted my first Bloom Day offering at cosmosgarden.blogspot.com. You're so lucky to have foxglove and hydrangea still in bloom--that's the difference between Zones 5 and 7, I guess. Anyway, Bloom Day is a wonderful idea--thanks so much. Your garden looks beautiful and your post is thoughtful as usual. I'm afraid mine was a bit quick. I prefer to call the resurrection lilies naked ladies and they smell good too. I dug mine up a while ago and I still haven't planted them. oops. The amaryllis bella donna multiply like crazy here and I'm not crazy for the foliage. Great post, Carol. I have mine up too. Usually I pull cilantro when it starts getting leggy and trying to flower, but this year I decided to let it go to seed. I never realized that the flowers were so delicate and pretty! Although my plant looks much more ragged then yours does. I'm a little late, but here are my contributions. I'm so late! Jeez I can never get this bloom day post done on time. Carol - those grapes rock! Anyway, the internet has finally cooperated long enough for me to upload some pictures, so my Bloom Day post is finally up: http://tinyurl.com/68dwn4 . Looks like you've a few white flowers and sedums too. I love to see the butterflies on the sedum flower heads. I guess you will get that too. Hi Carol - I have finally posted my GBD post (well it will appear tomorrow) - sorry for the tardiness I am on annual leave and lost track of time and the weather hasnt helped. and thanks, Carol, as always. I've been working on my Bloom Day post for several nights, and it's finally done. I tend to nod off at the computer these nights, so it takes a while! At least I see I'm not the only one who's late. That makes me feel a little less sheepish. My August lily hosta is not blooming yet. Lovely to see that so many people have been lucky with their blooms!